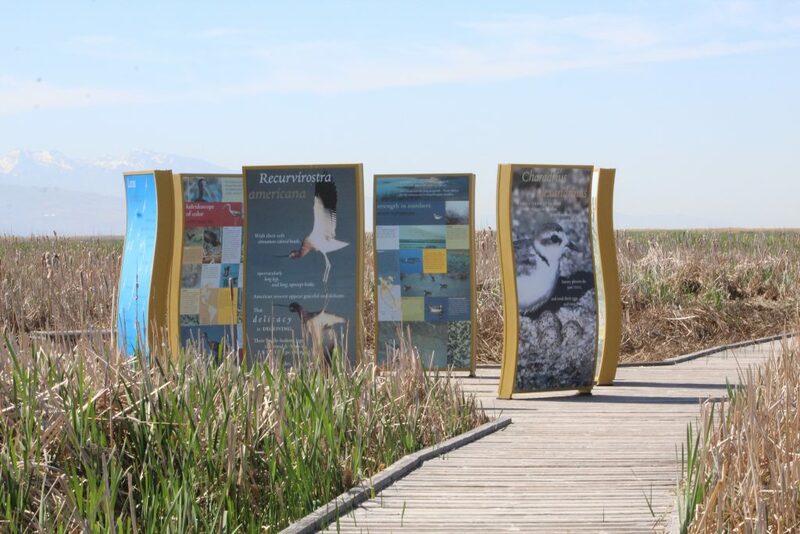 A great place for you to visit in early spring up in northern Utah is the Farmington Bay Waterfowl Management Area. It will not be a waste of your time! Such was my experience since I had a few hours to spend there. My drive inside started off rather well. The wind was howling, not too cold, and I was glad there was waterfowl galore to be seen! 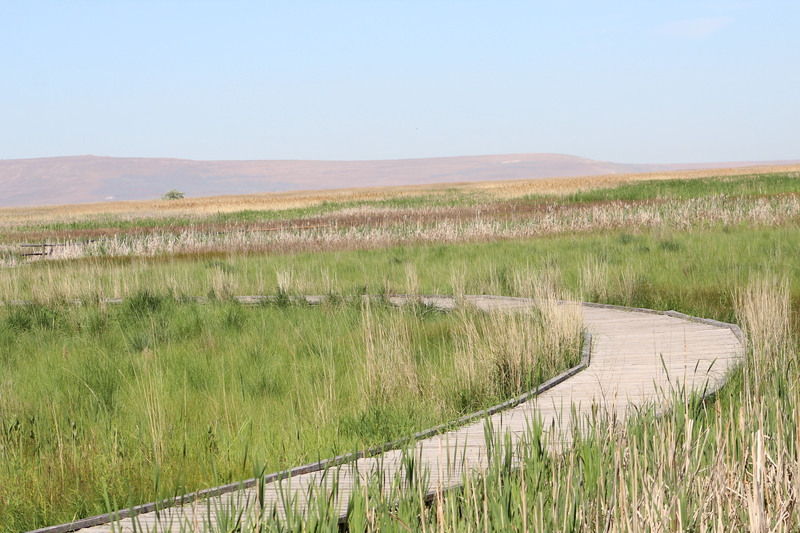 What IS Farmington Bay Waterfowl Management Area? 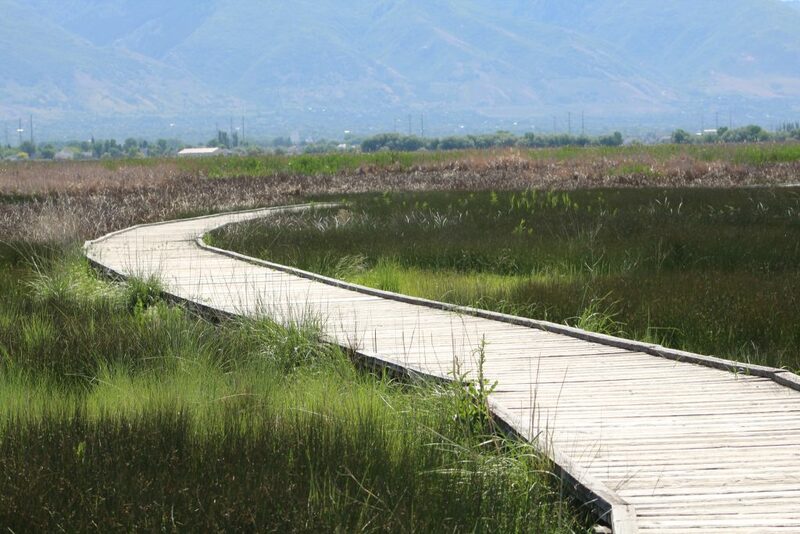 Farmington Bay Waterfowl Management Area plays host to various marshes, tidal flats, open salt water (it is adjacent to the Great Salt Lake). 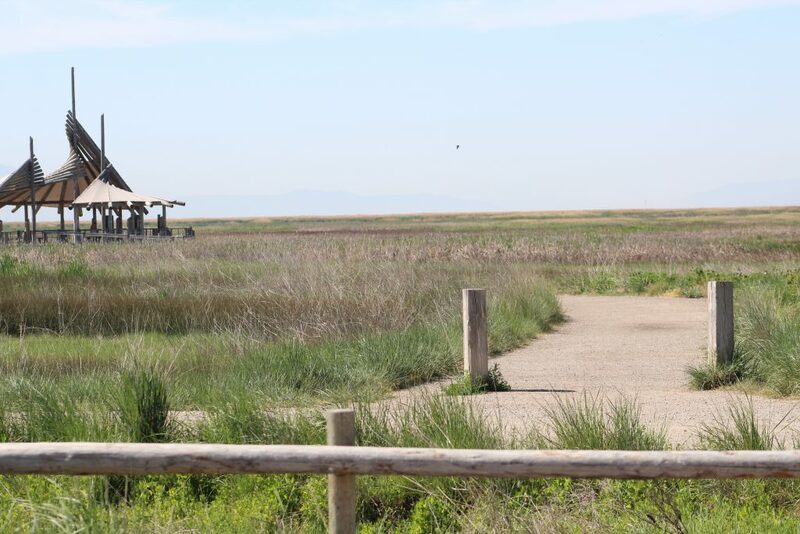 The management area was built in 1935 and now the Utah Division of Wildlife Resources manages the area. The landscape there is also home to some freshwater ponds. Many types of tall grasses grow there which provide food and shelter for birds. 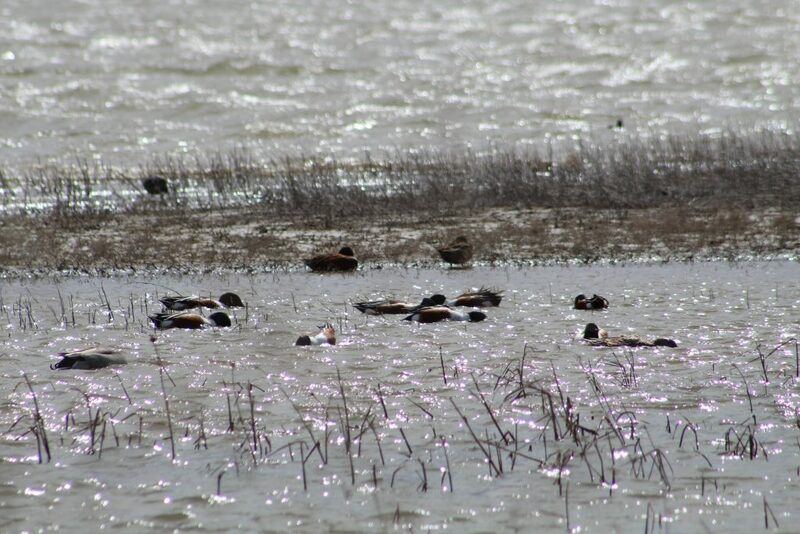 During both the spring and fall bird migrations, there are many types of waterfowl you can observe there. Geese and ducks begin checking in during February, while shorebirds and wading birds arrive March to April. The wooden sides were gone on this nest, but she was still there! What Can You Expect During the Year? 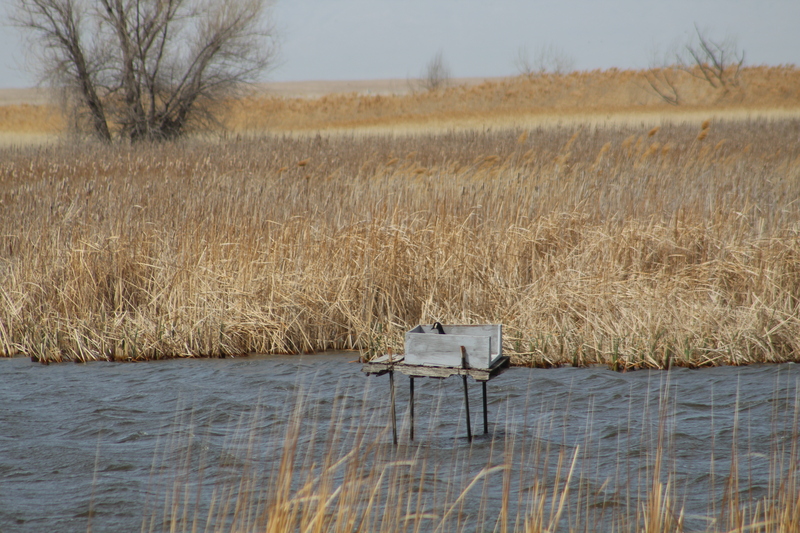 Some birds begin nesting in March at Farmington Bay Waterfowl Management Area. March through August is typically breeding and raising baby birds time, so part of the area is closed to provide the birds safety during this crucial time. Many species breed and nest at Farmington Bay, and there are some closures to the area during that period. 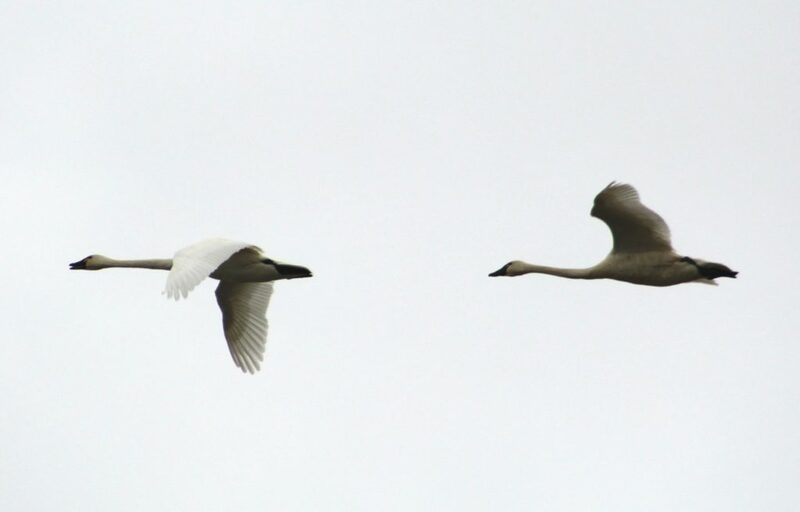 Fall migration begins in September, followed by winter, in which Tundra Swans and Bald Eagles are mostly present. The area is fed by the Jordan River and is managed with dikes, canals, and other methods to control the habitat. You can view from your vehicle or get out of it. Have a bike? The paths are flat and great for biking. 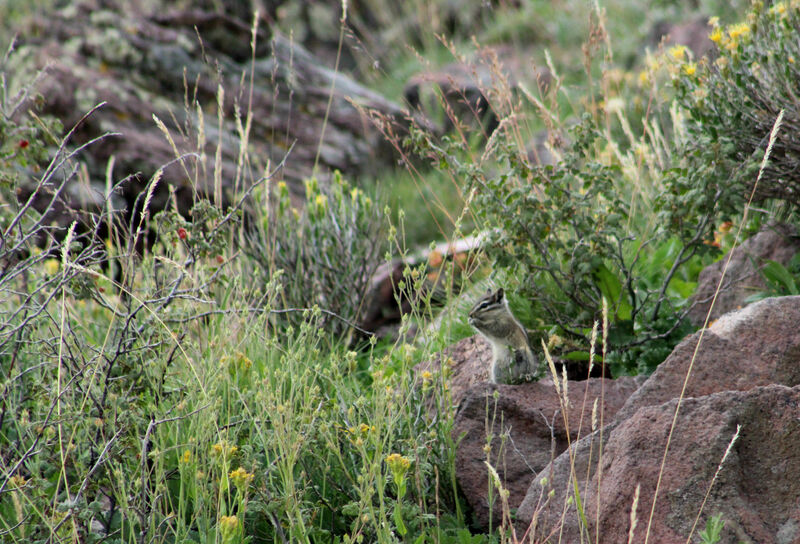 Do you like photographing or like to video wildlife? If so, this is a great place for doing so. 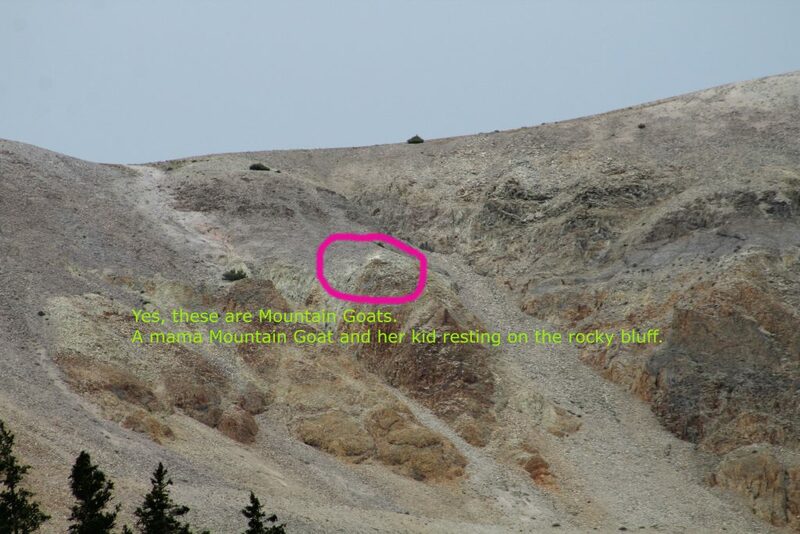 Bring binoculars and of course your camera! Even recording the sounds with your phone is way cool! Be sure to dress for the season you visit. 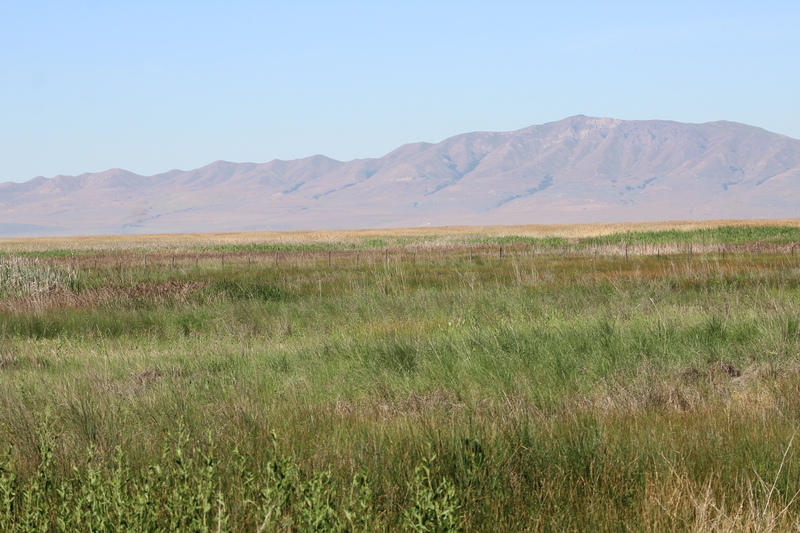 Driving into Farmington Bay, there were the previous year’s Cattail grasses lining the drive. Lots of sounds were coming from them and had to be investigated! 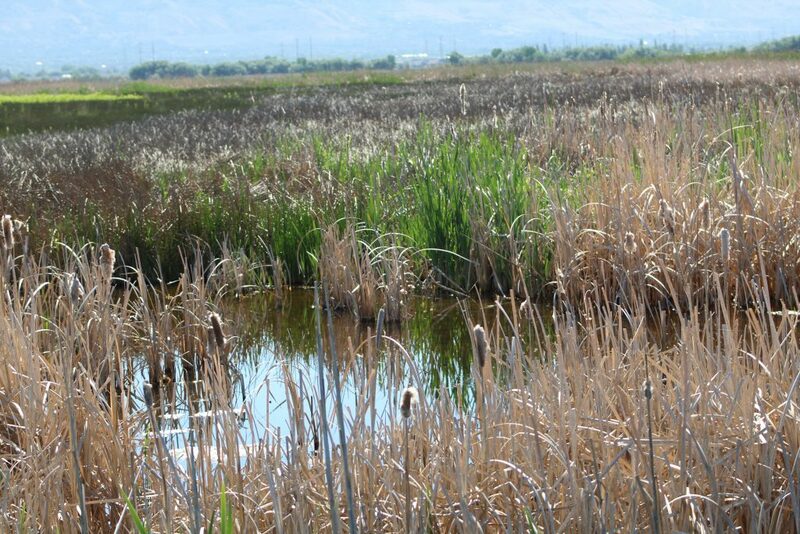 When I was driving in, the previous years’ cattails were a tan beige color. Cattails provide the perfect place for the Red-winged Blackbird and the Yellow-headed Blackbird. 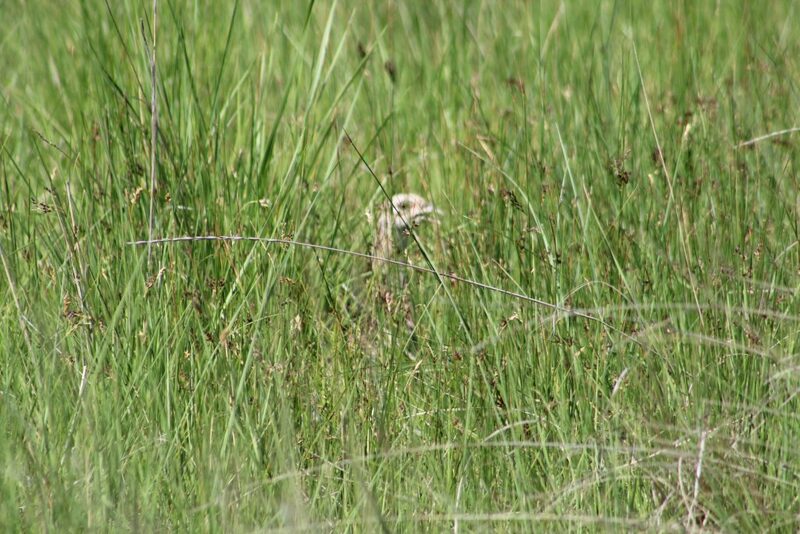 Rolling down the car windows can provide a second sense for locating and observing just who is lurking in the tall grasses. 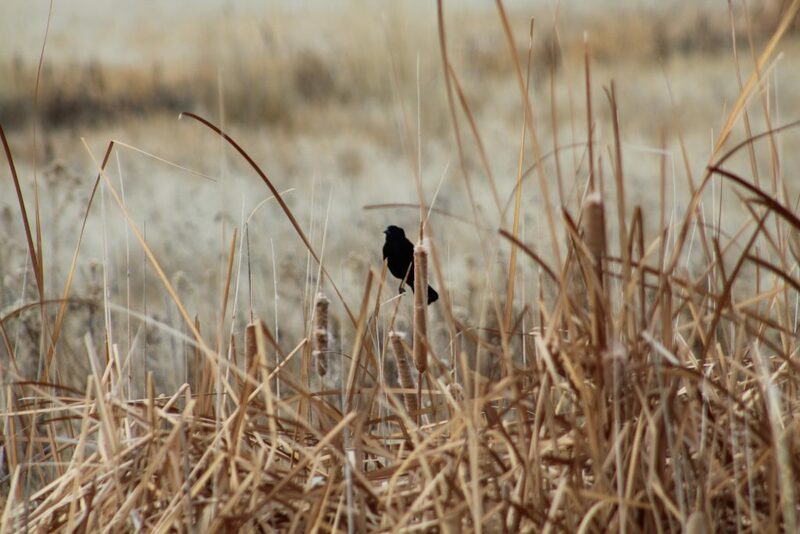 Their dark contrast of black against the tan grasses made them fairly easy to listen to and observe. It was incredibly windy there the day I went, but mild in temperature. There were white caps on the waters and some birds seem to have been struggling trying to fly in the winds. The first foray of birds I encountered driving in were American Avocets, Northern Shovelers, American Coots and Canadian Geese. 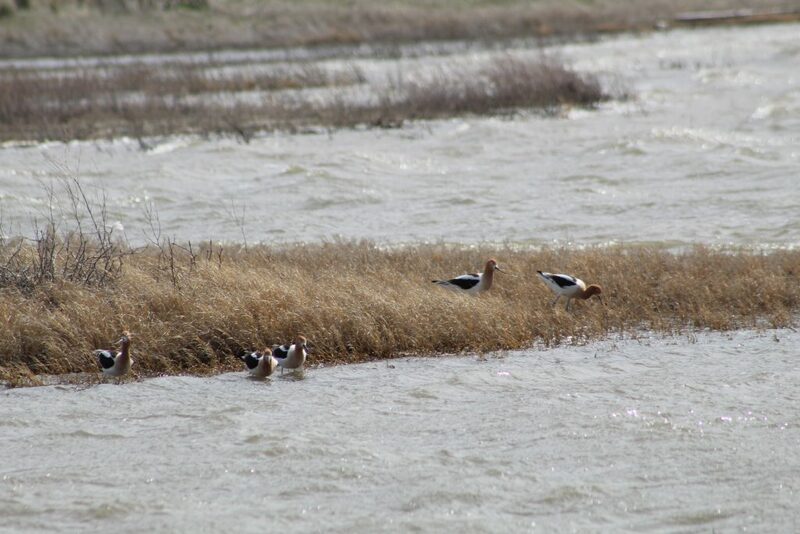 American Avocets were in their breeding plumage, and were foraging for food against the brisk winds. Northern Shovelers were in the foreground “dabbling” their bills back and forth screening the water for food. 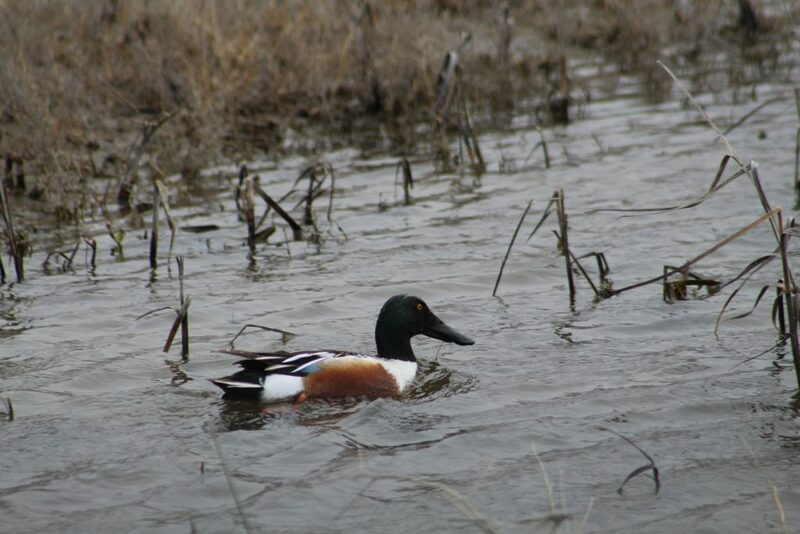 Thanks to a zoom lens on the camera, I could see a close-up of a gorgeous Northern Shoveler. Love was definitely in the air as American Coots chased each other on top of the water…as if running on top of the water itself! Seems the nest box had seen better days is this marsh, but this Canadian Goose was sitting on her nest in what was left of the box anyway. The wind was kicking for sure! Driving slowly along the path I saw some movement down in the shallow muddy grasses. 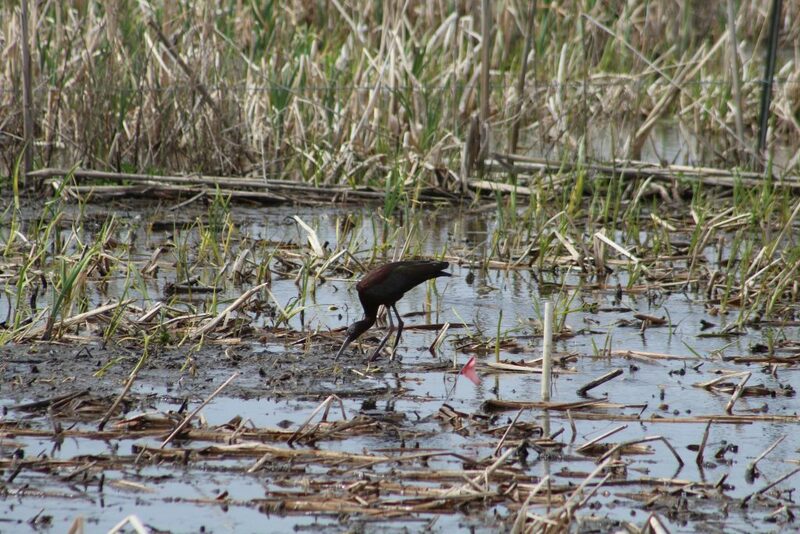 There retrieving its food, was the beautiful and irridescent White-faced Ibis! My first time ever seeing one! 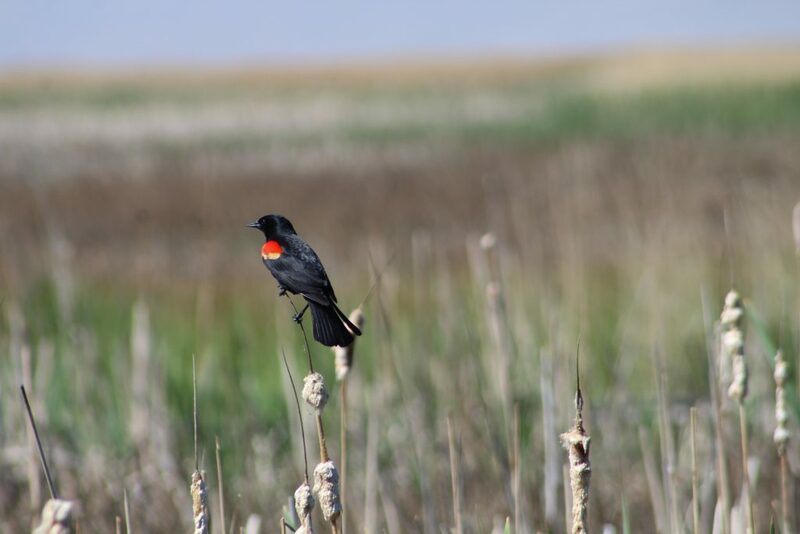 One of the nicest songs to hear is that of the Red-winged Blackbird, and it was singing! 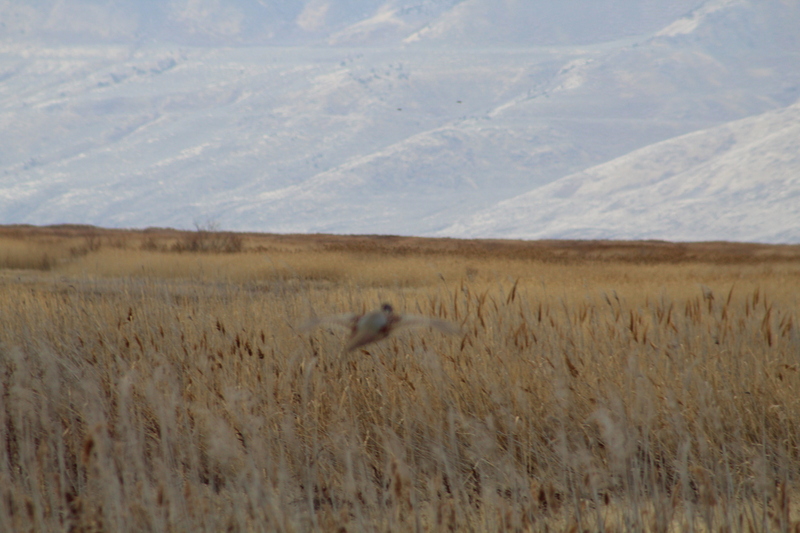 Just above the cattails is a beautiful Northern Harrier soaring as it looks for an unsuspecting meal. Flying just above the water are beautiful American White Pelicans. They don’t dive into the water like their Brown Pelican cousins on the eastern seaboard.They coral the fish together to eat them. I barely even noticed this beautiful Great Blue Heron due to its camouflage in the tall grasses. 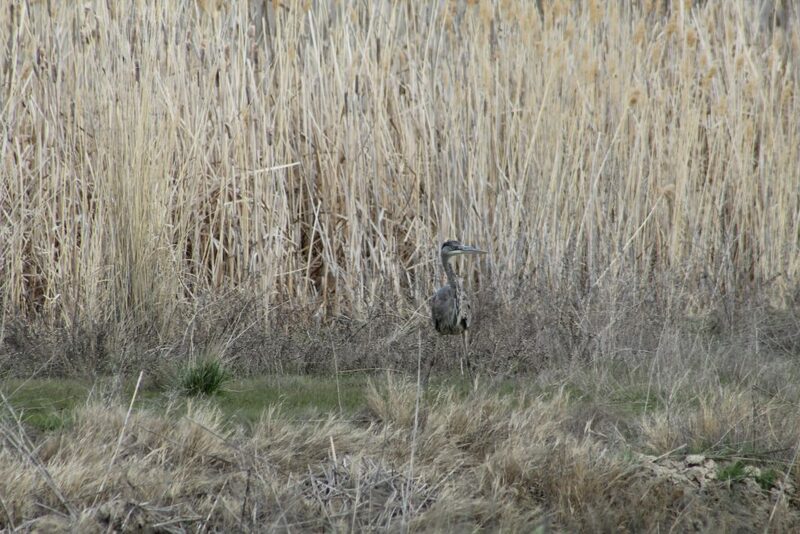 After visiting the Farmington Bay Waterfowl Management Area I was really impressed with the waterfowl there. The close proximity you can get even from a car to observe the birds was incredible. The paths made it such that you could even hear the sounds the birds were making. It was nice to get out of the car, but the fact that you can take photos right from your car was a big advantage to me there. 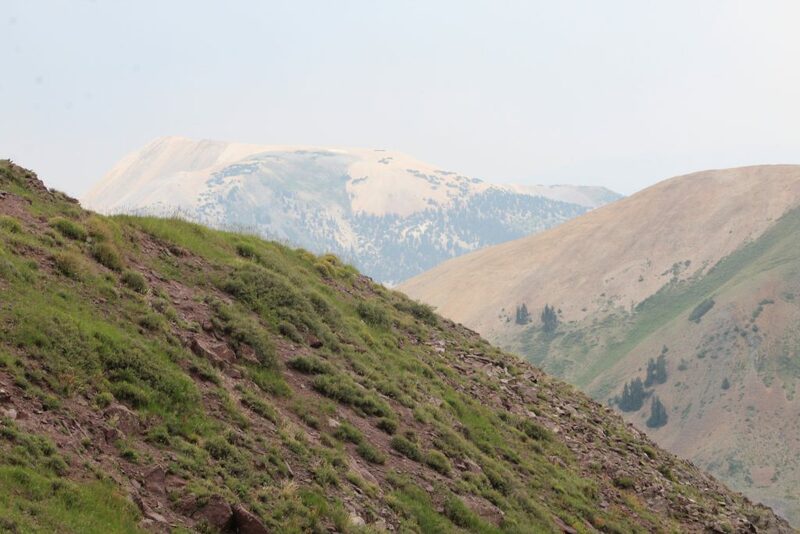 Check it out online before you go to know when the best time would be for your visit, and when it’s hunting season there (if you plan to have a quiet visit). 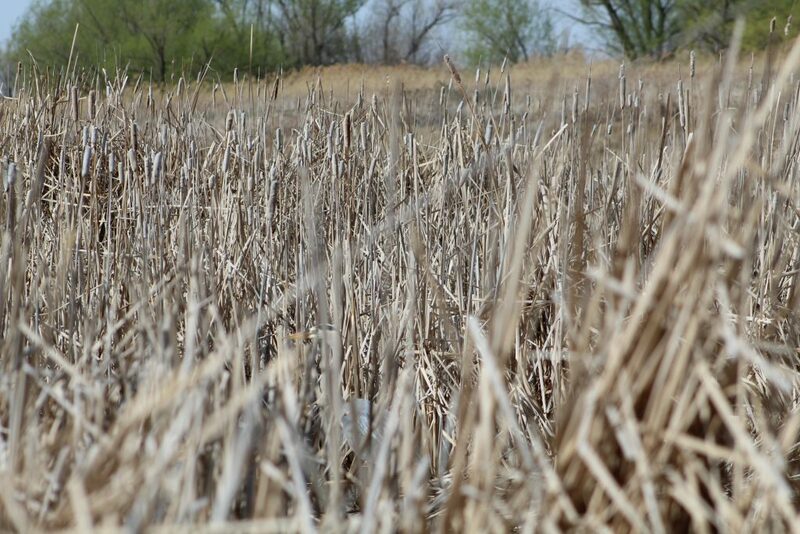 For seeing some great waterfowl, this is one place you don’t want to miss! 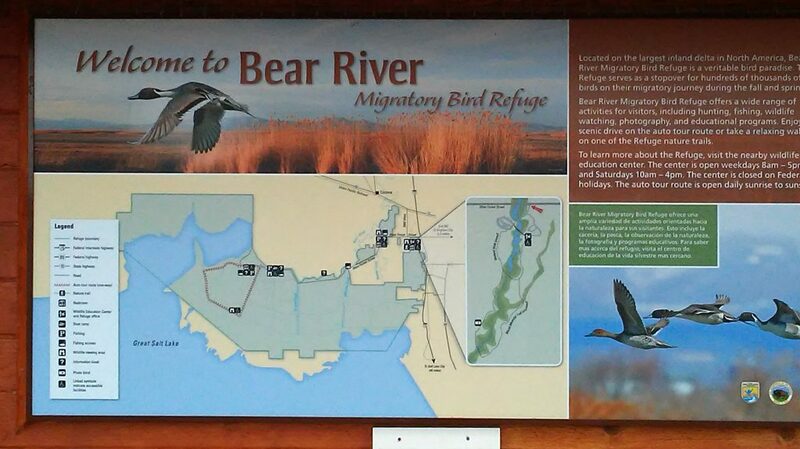 Exploring the Beautiful Bear River Migratory Bird Refuge! 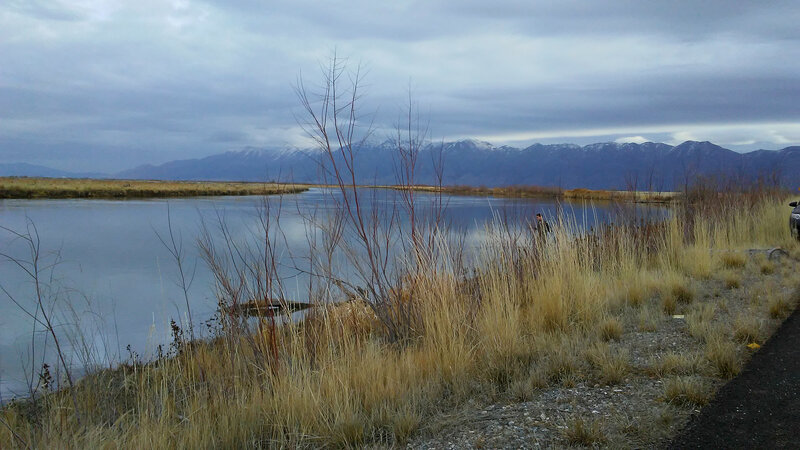 Little did I know how cool this western Refuge in northern Utah of wetlands bordered with snowy mountaintops would be. Bear River Migratory Bird Refuge was full of migratory birds and even some other interesting mammal wildlife. The sounds of the large Tundra Swans overhead and in the water was a true ensemble of an avian choir! 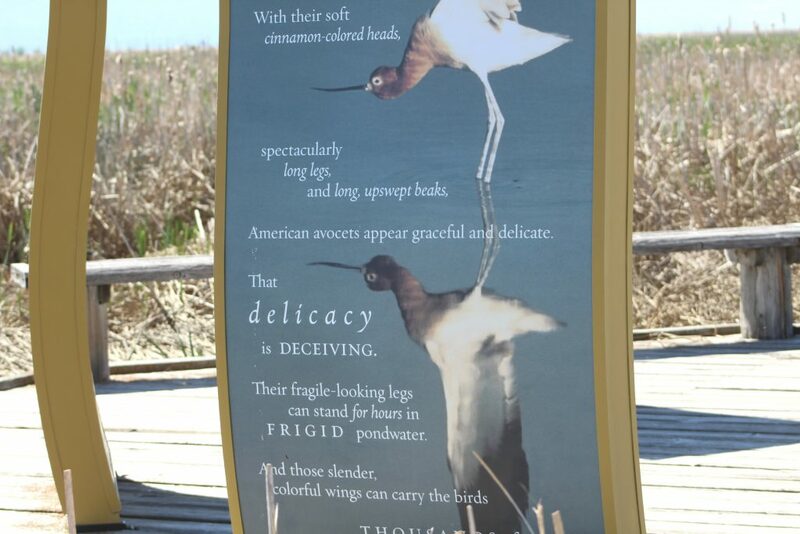 Although I’m used to the refuges back east in the oak, pine and swamp forests with their accompanying vast wetlands along the rivers, creeks and sounds of my North Carolina, I found this Refuge to be one of expansive beauty all its own. 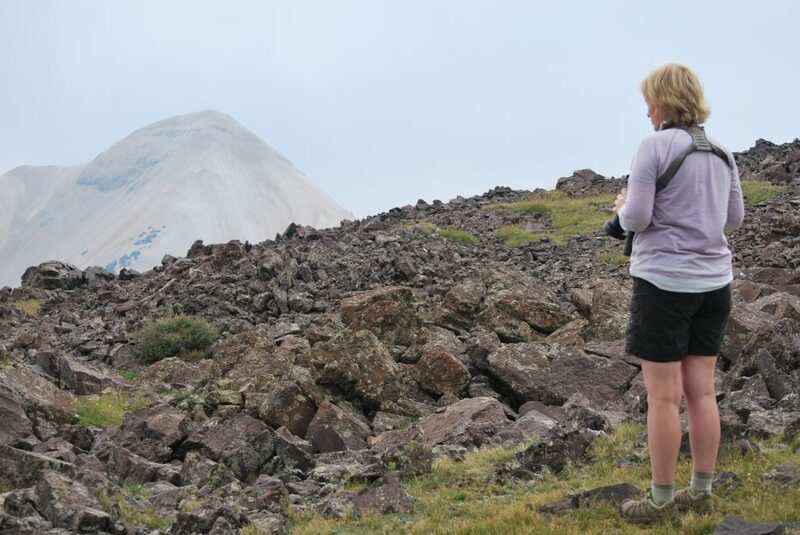 It’s a good idea to go visit the website of a refuge if you can BEFORE you go so you have an idea of what to expect. Make special notes of things you don’t want to miss while there, and download or print a list of birds, etc. to look for. 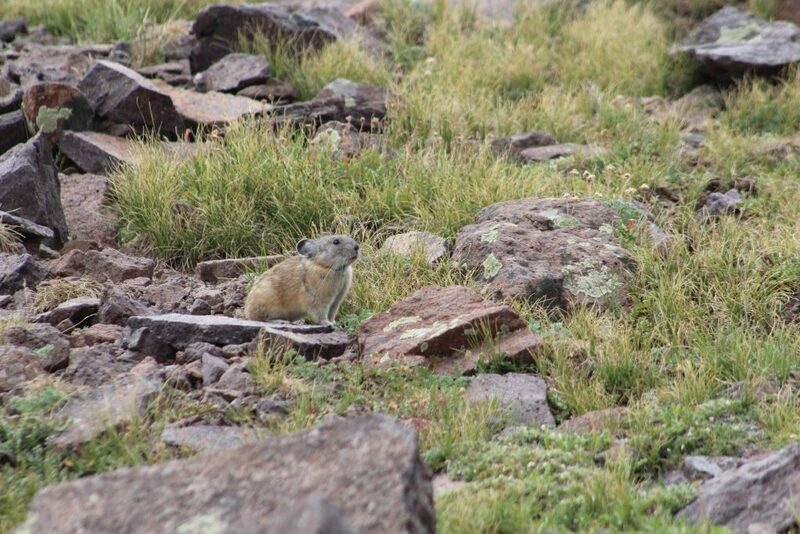 This will give you time to familiarize yourself with the common resident and migratory wildlife at the particular time of year you go there. 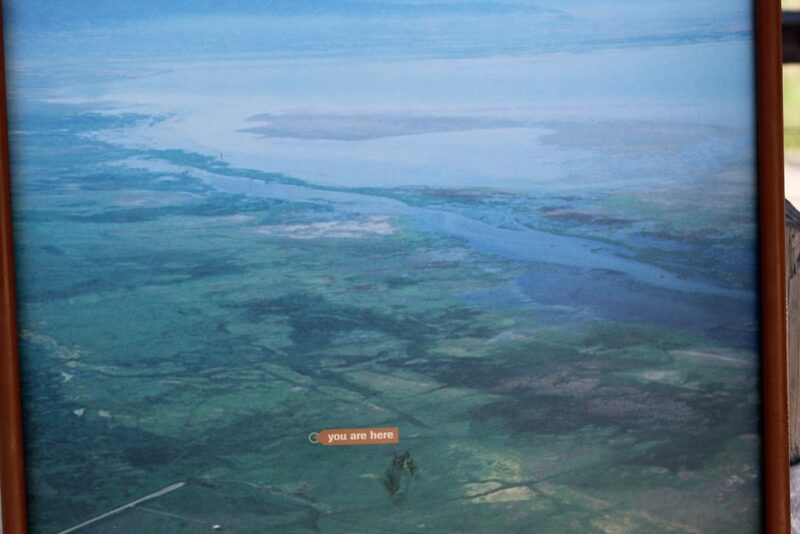 Due to the draining the area for irrigation back in the early 1900’s, there was a loss of marshes. A huge outbreak of avian botulism occurred. 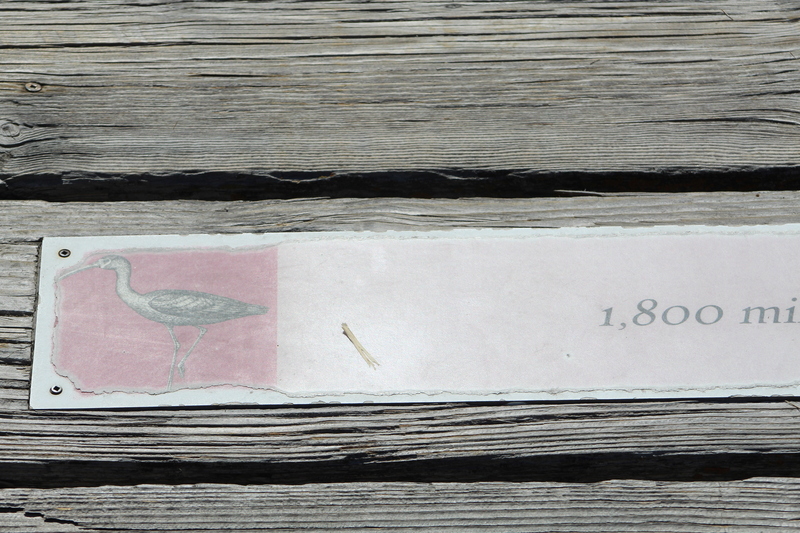 As a result, it killed millions of birds in the early 1900’s. Local people and sportsmen petitioned Congress to establish a refuge for wildlife in the marshes in the Brigham City area of Box Elder County in Utah. 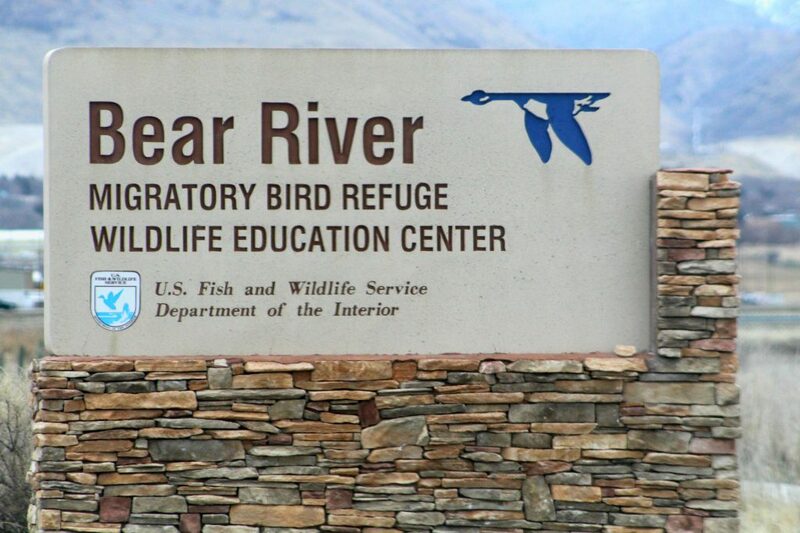 On April 28, 1928 President Herbert Hoover established the Bear River Migratory Bird Refuge. It lies in the Great Basin Hub of the Pacific Flyway for migrating birds. 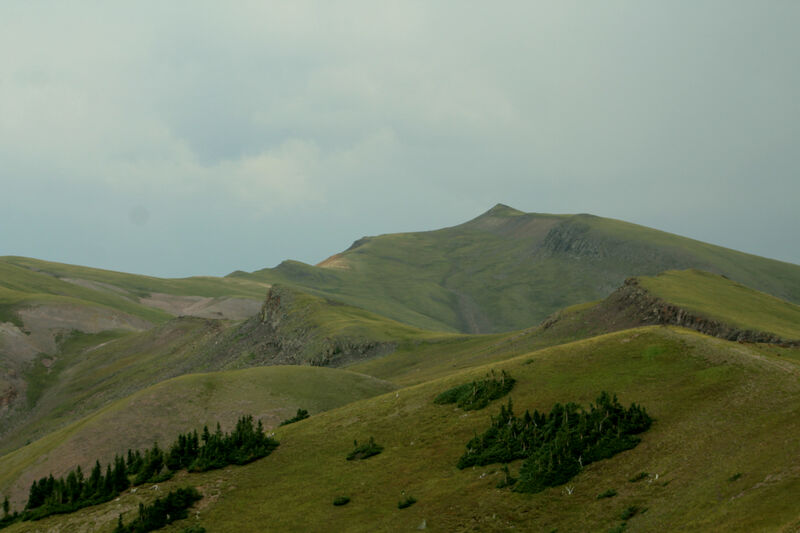 It has various mammals that live there in addition to waterfowl and other birds. 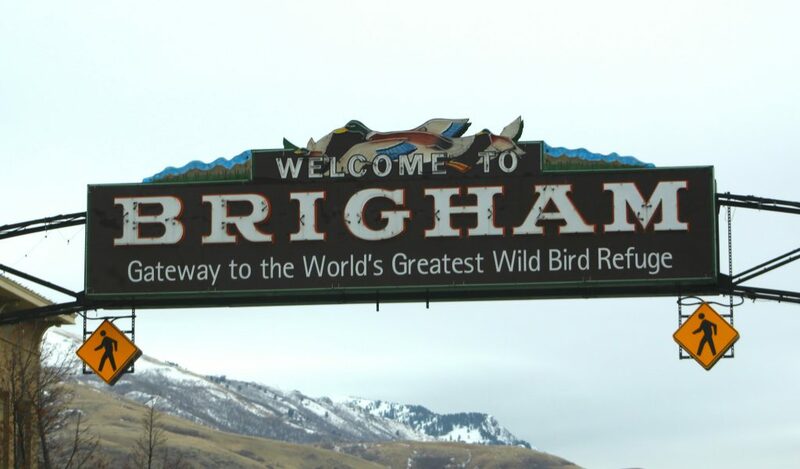 This huge sign goes over the street downtown in Brigham City, Utah about the Refuge. The visitor center was closed as we were there on Sunday. Obviously, that would have been a great place to start for information. However, there was a stationary information station just outside the gate that allowed us to get some of the pamplets for the refuge and see larger information posted on the station. 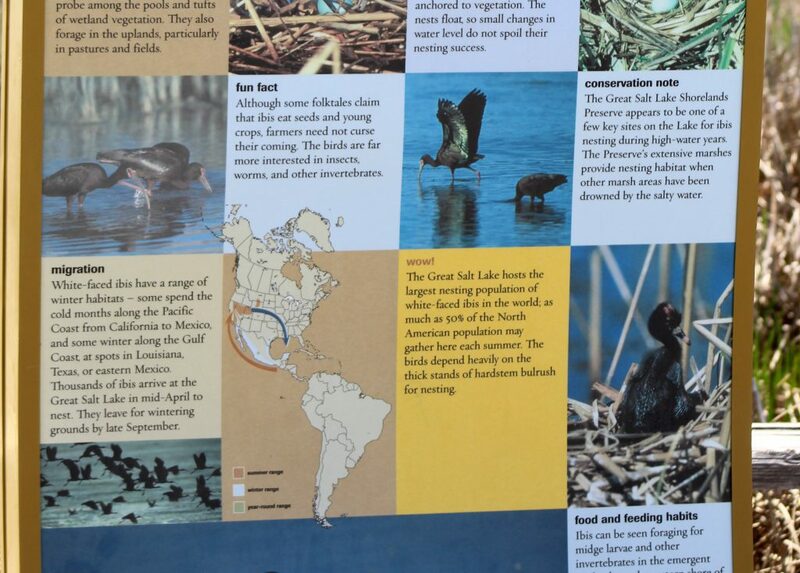 The information at the outside the gate station shows some of the birds you might encounter here, and a topographical map. Below the colorful poster was an enclosure attached with pamplets. One was about the Refuge, what could be seen during all four seasons, the best way to observe the Refuge and wildlife. 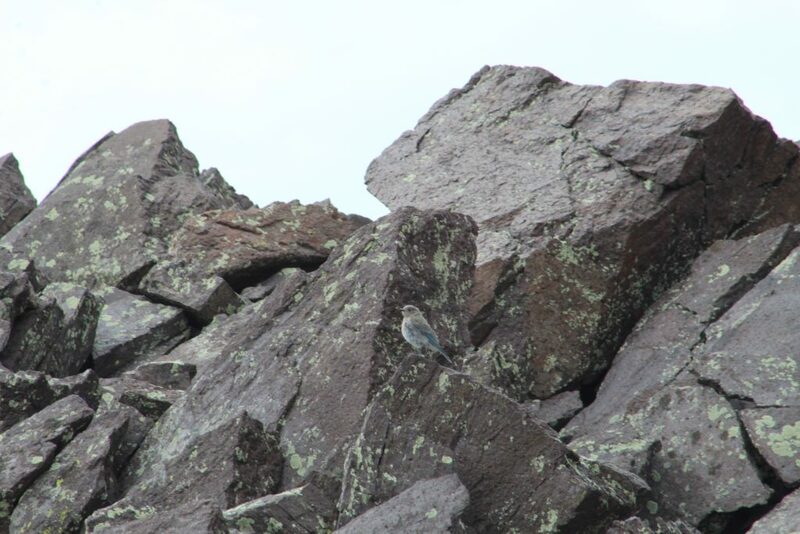 Another was a bird list that could be seen. 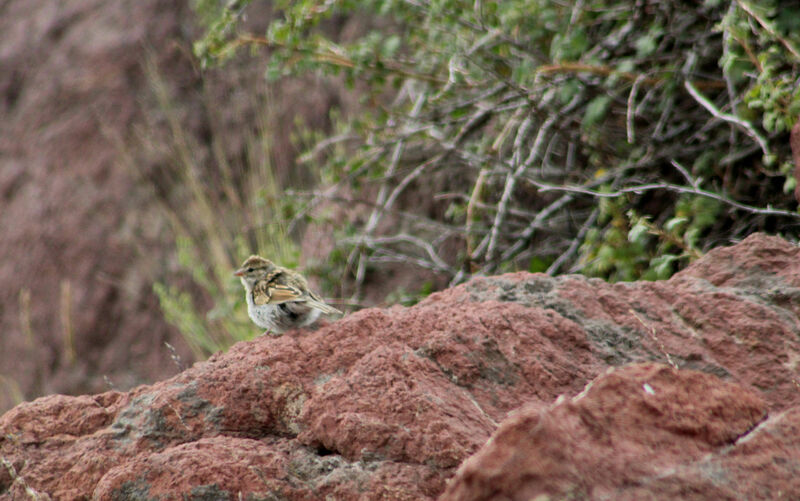 It informed if the bird was common, uncommon, occasional, rare, permanent, there during which season, and if was migratory. The other pamphlet (not shown here) was equally as important…the hunting and fishing regulations guide. 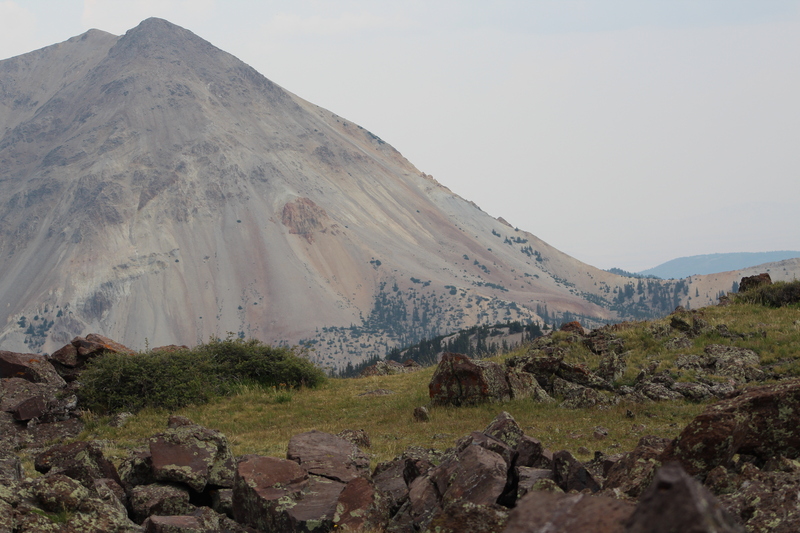 Once we saw that the best way to observe this great place is to bike or drive their 12-mile tour route, we were excited. As we began our drive, we rolled down our windows to listen out for any sounds we might could hear. 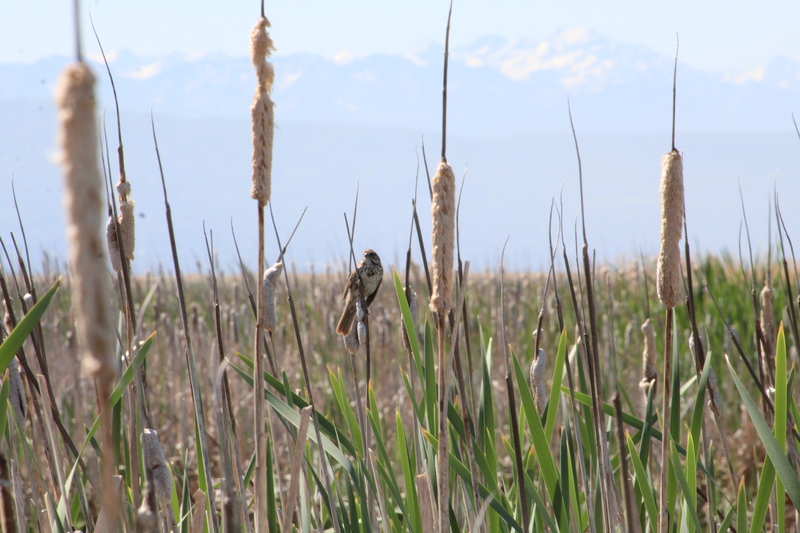 It certainly didn’t take long before we heard a most familiar sound to this North Carolina gal…the beautiful singing of a Red-winged Blackbird in the reedy marsh grass growing alongside the road! 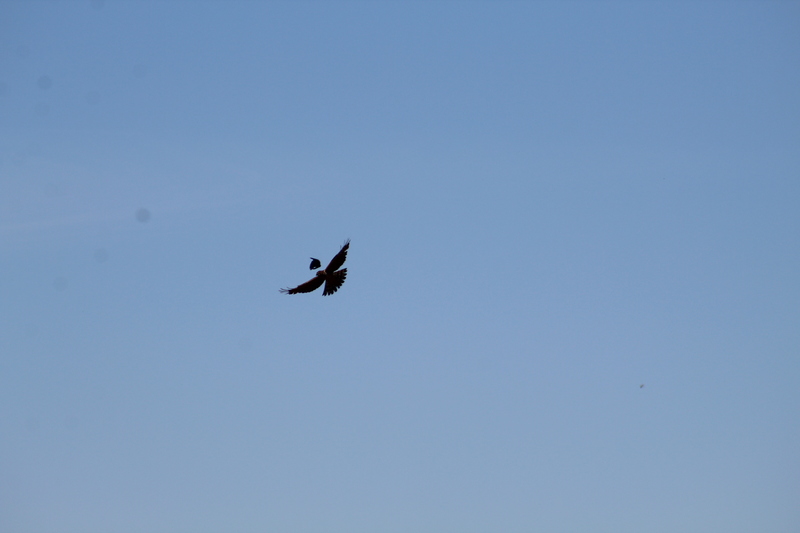 First Bird Encountered…the Red-winged Blackbird! 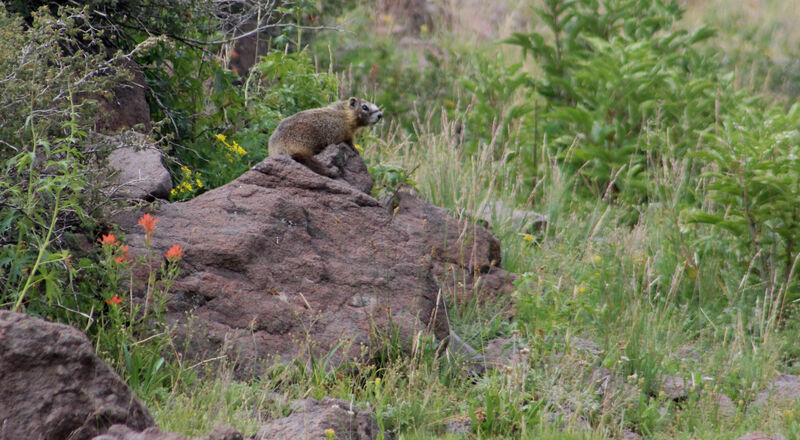 The fact that you could just pull off the road here at Bear River to observe and listen to them was great. Permanent resident in most of the U. S. Check your local field guides for occurrence in your area. 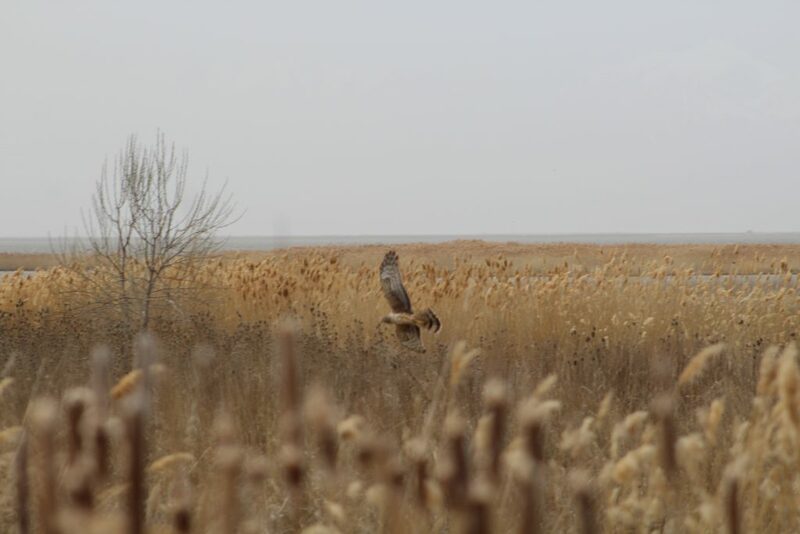 Hunting at a Refuge? Yes and with REGULATIONS to Guide You! 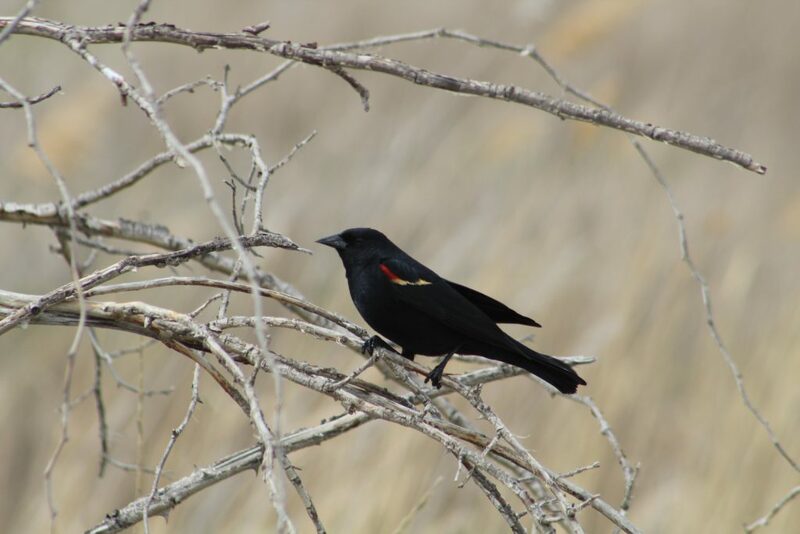 We stopped off the side of the road after we left the main gate to the visitor center so I could get just outside the car door and “shoot with a camera” a few photos of the Red-winged Blackbird. As I was taking photos, a car pulled up alongside my spouse’s driver side of our vehicle with their passenger side window rolled down. The guy was in dark camouflage and said, “I can shoot a bird here. I can hunt.” Oh boy…city has come to country I thought. I’m not a hunter, but I could see that they might could hunt here during certain hunting seasons if it was allowed. However, we could tell this guy really didn’t know if he could or not, but he was ready. I got back into the car and my husband handed him through the window, the U.S. 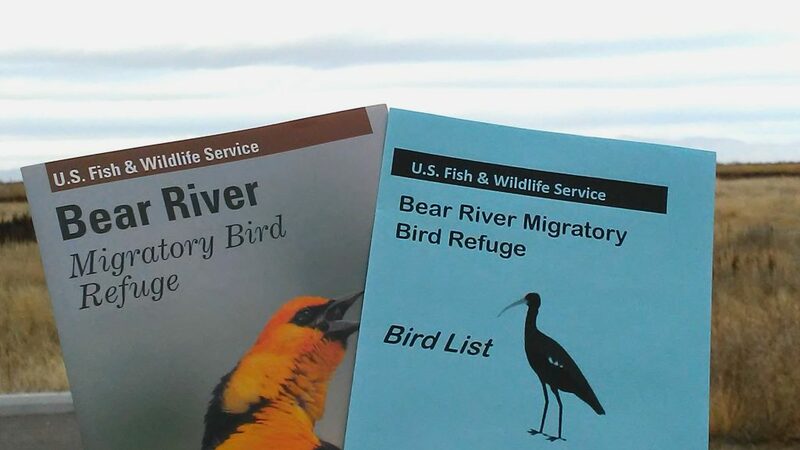 Fish & Wildlife Service Bear River Migratory Bird Refuge Hunting and Fishing Regulations brochure. The guy wasn’t sure if he could hunt right now, but again he was ready. We told him we didn’t know the hunting season for ducks. (I’m not a hunter and am not familiar with hunting regulations by any means.) The guy pulled off and we continued on discussing what had just happened. What is That Photo-bombing My Bear River Photo? Bear River…and Elmer Fudd…and his car parked just off the road. 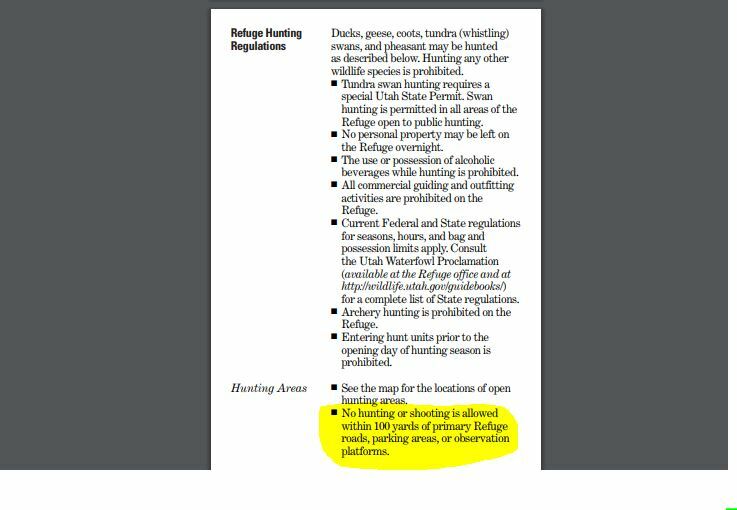 From page 3 of the Hunting and Fishing Regulations, the highlighted are clearly says no hunting or shooting from within 100 yards of primary Refuge roads. This road we were on was the main refuge road to get to the auto-12 mile one way route through the wetlands. That would be the shortest 100 yards for sure from his car to where he was standing in the edge of the water. After I got back into the car, we were still discussing this guy. Being unsure of just what he was hunting and as a new birder to this area, I certainly would have a hard time ID’ing some of the geese here. I did manage to get a photo of the back of his car with an out-of-state license plate as he drove past. We resumed our driving looking for and at different birds. We were still heading towards the official auto-tour paved 12 mile route to experience the drive through the wetlands to observe birds and other wildlife at the Refuge. It wasn’t long before my spouse stopped and exclaimed, “There’s a Ring-necked Pheasant (Phasianus colchiucus)!” That was a first for me. 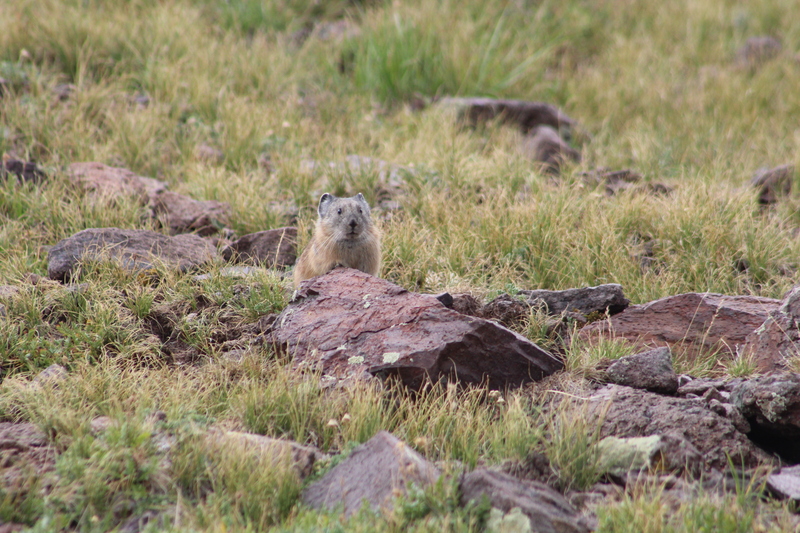 He was standing out in the middle of a field of yellow tan grass in all his colorful glory! What a beautiful array of color for the eyes in this yellow-tannish grassland! 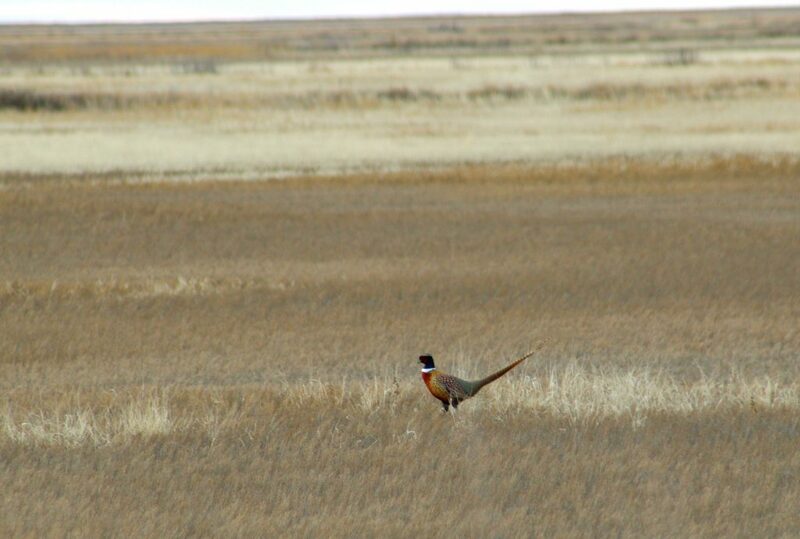 The pheasant didn’t stand still in the field for long. 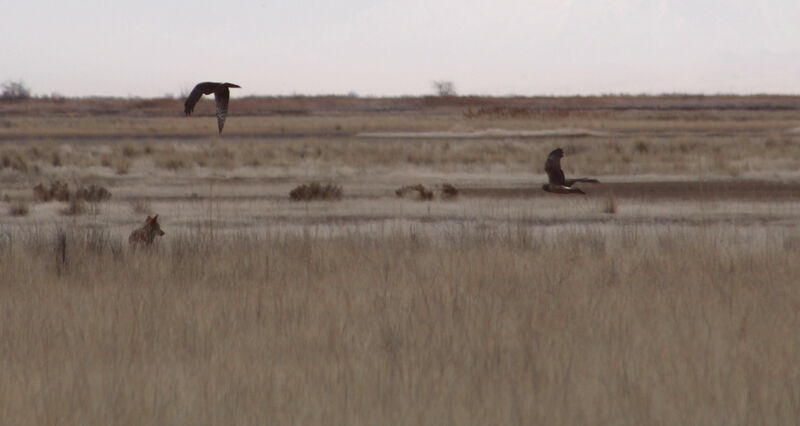 He broke out in a trot, then went airborne across the road over to the adjacent field. I was surprised at how fast they could run across the ground. It was quite a fanfare. Just to the right of the chart key, is a dotted road going one way around the marsh. This would be the auto-route through the wetlands. We finally pulled into the parking lot where there was an observation tower, and a covered picnic pavillion to begin the tour. There was couple in the parking lot unloading their bikes. And you guessed it…Elmer Fudd’s car was there, too. About the time I stepped out of the car to start taking some photos of a bird that landed on the pavillion, I heard two gunshots directly in front of me coming from the burned black section just off the parking lot. The shot was soon followed by a hull-a-ba-loo of squawks and honks from about 5 Canadian Geese who took off in flight in the opposite direction from the gunshot. The couple and I spoke about the gunshots and the male cyclist was pulling out his cellphone to call a friend to let him know what was going on here. They began their cycling and we proceeded on the auto-route. I’m not sure just what the procedure would be in inquiring about something like this. 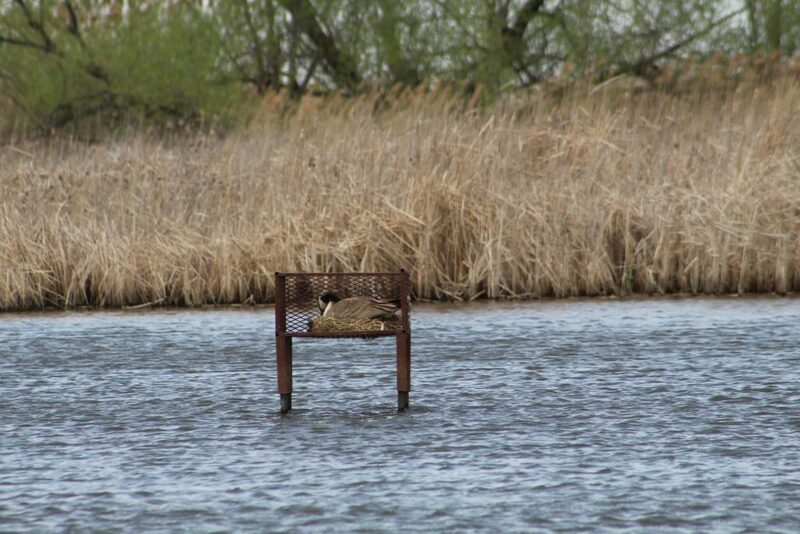 The couple said they thought hunting season for ducks was over two weeks prior, but I had no idea. It concerned me that the hunter proceeded without knowing the season or regulations. Again, I got out to look at birds landing in the grass and looked down into the water near the road and a Muskrat was swimming across the water from the grass to the other side to the grass. Sometimes Muskrats get confused with Beavers and Nutria. 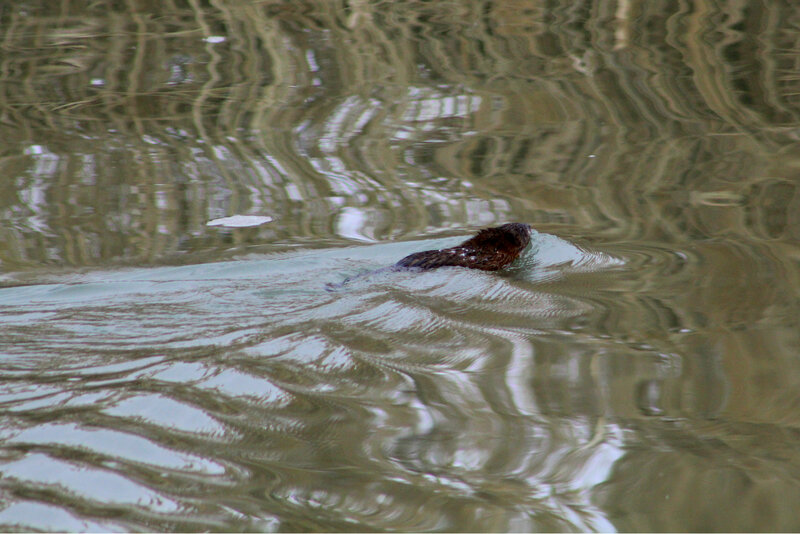 Muskrats are half the size of a Beaver, and has an 8 – 10 inch rat-like tail. Beavers have flat ones. The Muskrat’s tail will serpentine in the water behind it, and helps propel it through the water. 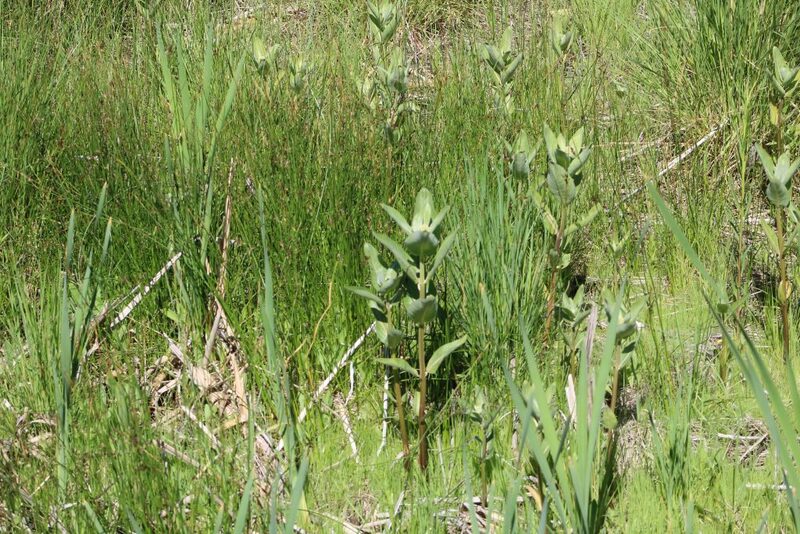 Also, Beavers store food for the winter, where as Muskrats need to eat plant material everyday. Nutria are smaller than a Beaver, but larger than a Muskrat. See the video below I made of it swimming. If you’ve ever seen them, and heard them, Tundra Swans are unforgettable. Their flocks are not known for being quiet. Every year during migration back home in North Carolina, Lake Mattamuskeet is filled with these. 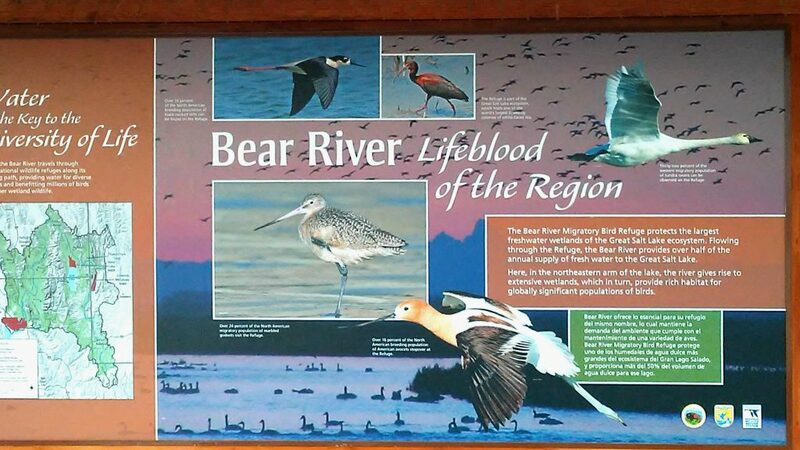 I guess you could call it the eastern counterpart to Bear River MBR. Between the sounds of these guys, and all the other migratory birds floating in the water, the sound is incredible. Well, Bear River MBR was to be NO different where sound was concerned. It was noisy! Everyone was talking at all at once! 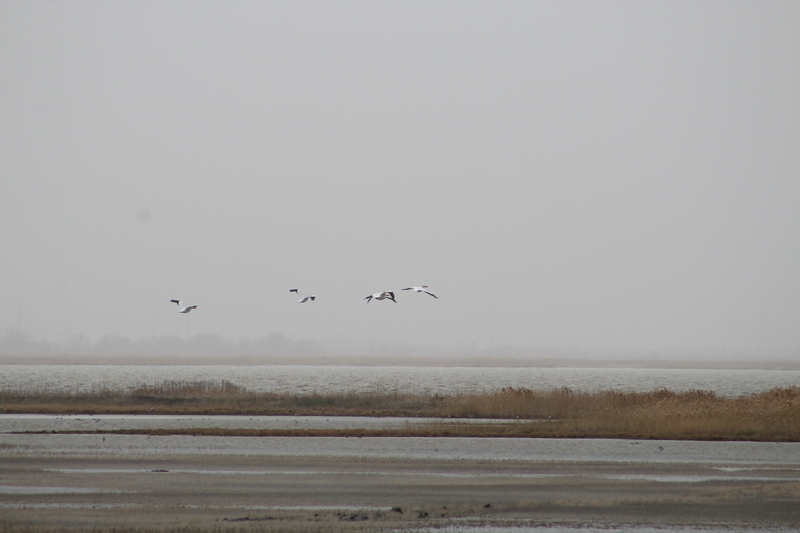 Tundra Swans flying with necks outstretched, and their black feet out behind them. While seeing the Tundra Swans was fascinating, the next birds we found were really cool to see. We surely pulled over to watch the acrobats of two Northern Harriers birds of prey. Northern Harriers (Circus cyaneus) remind you of an owl in the face. They have a face that looks similar to an owl. 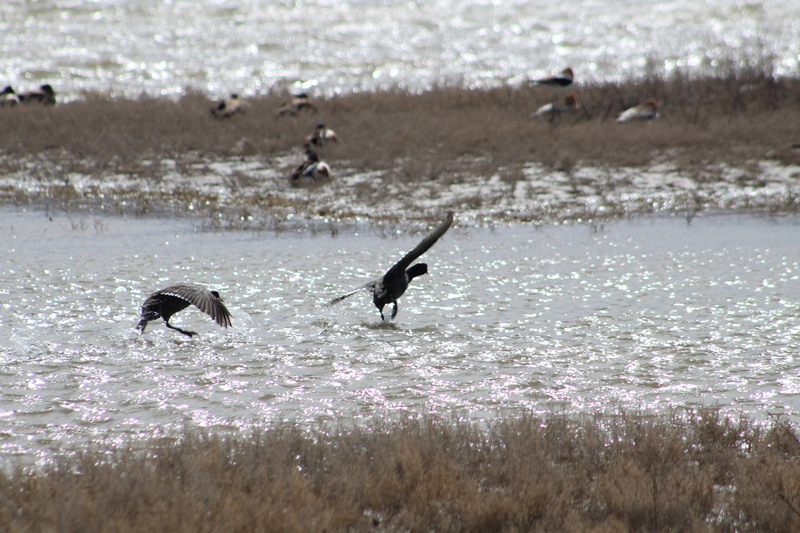 There’s a noticeable white rump patch visible from their backside in flight. They rely on hearing like an owl to help find their prey, hence the facial shape. 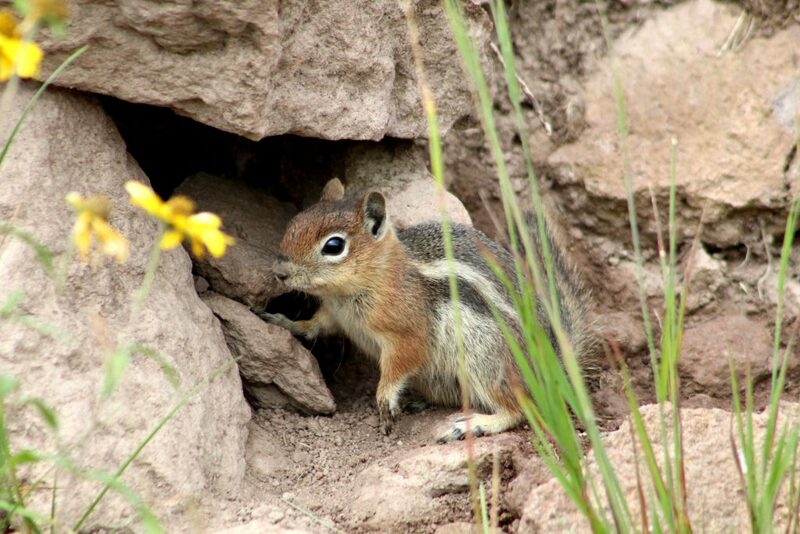 Year-round resident here in Utah; check your local field guide for occurrence in your area. Males may have several mates at once. Fly low over the ground when looking for food. It’s possible these two were doing the “skydancing” ( a flamboyant flight display) in my photos. Both sexes can perform this. 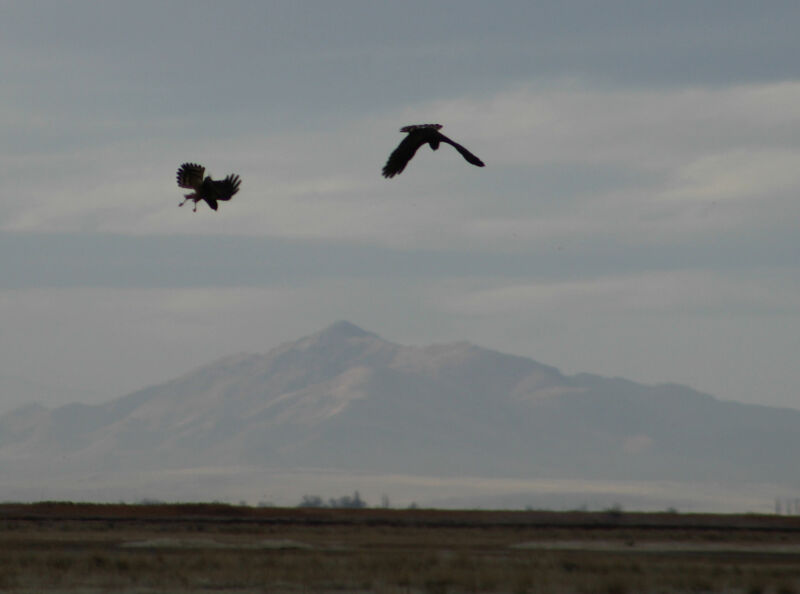 The female can turn over on her back in flight and put her talons towards the male. Have not ever seen this type display before. 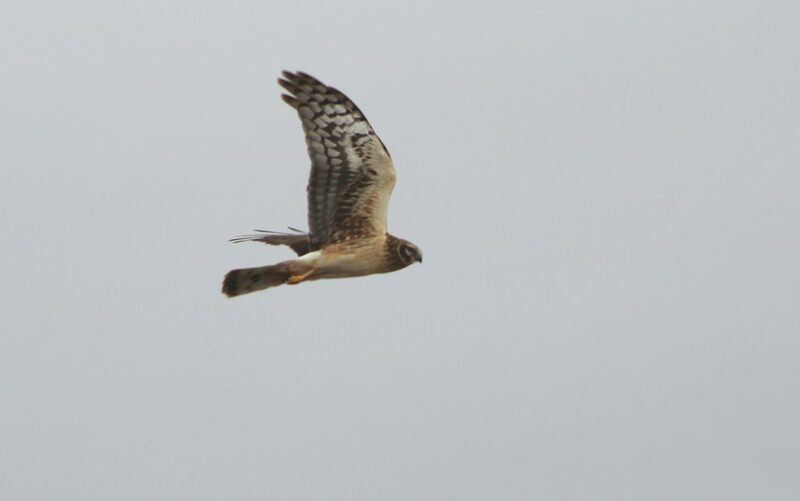 Closeup of one of the Northern Harriers. Notice how the face resembles an owl? 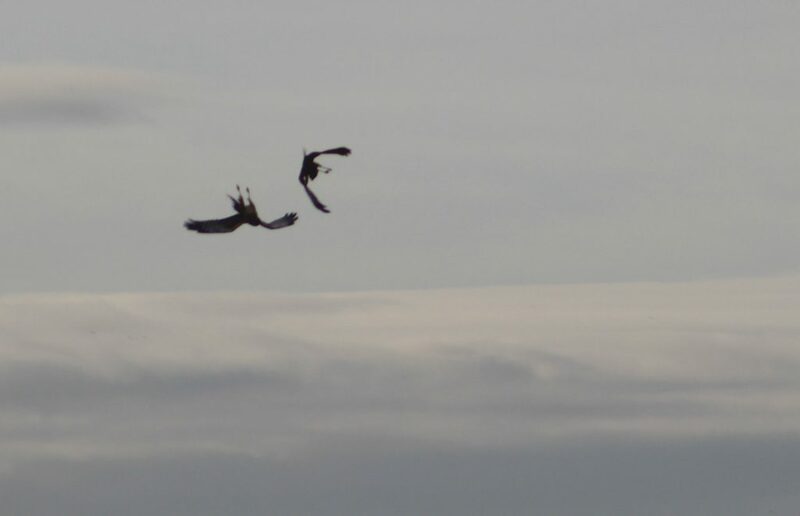 And, the acrobats begin!…”Skydancing” Northern Harriers. 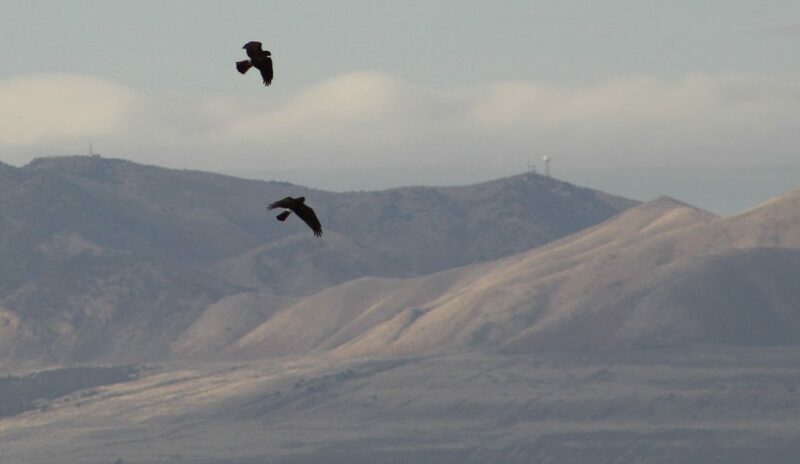 Flying about over the Refuge. I really like this photo! 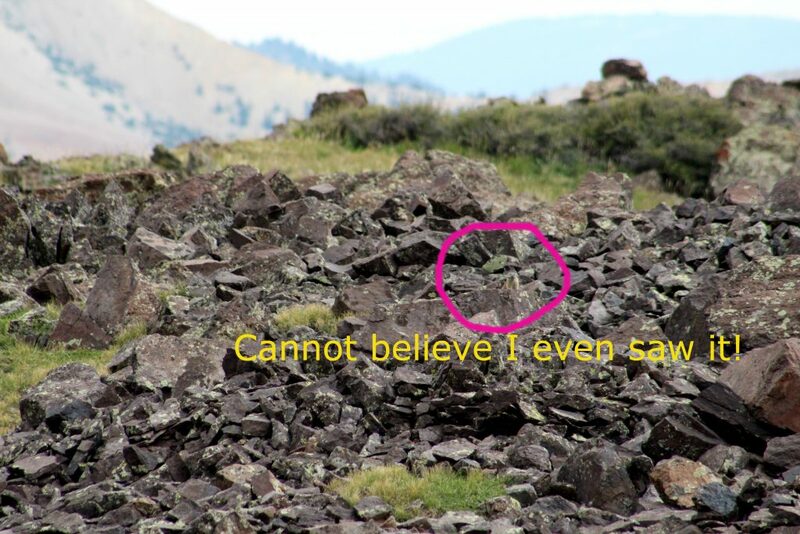 Notice the coyote that photo-bombed the Northern Harriers in the left center of the photo? And the sky dancing continues! It was well maintained. The birds were wonderful to see and the other mammals as well. I would think spring would be fascinating to see at breeding time. 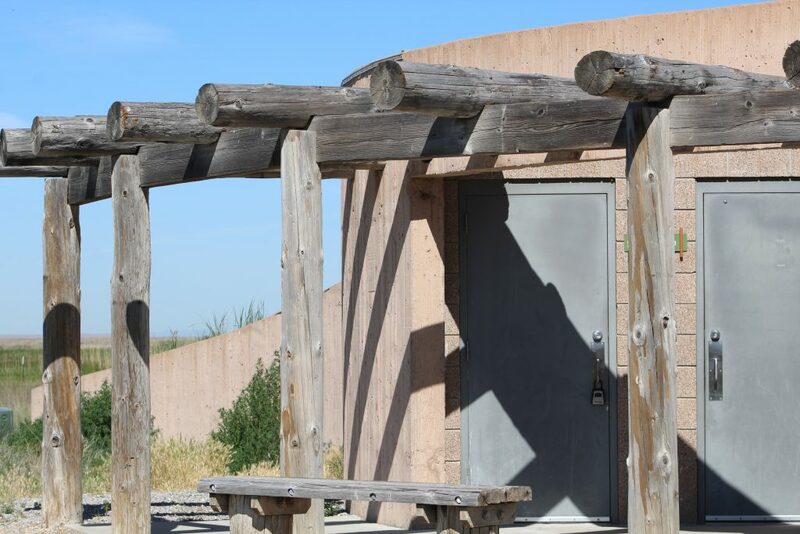 It would have been nice to go inside the visitor center, but since it was closed, we may incorporate that into a spring-time visit to the Refuge. 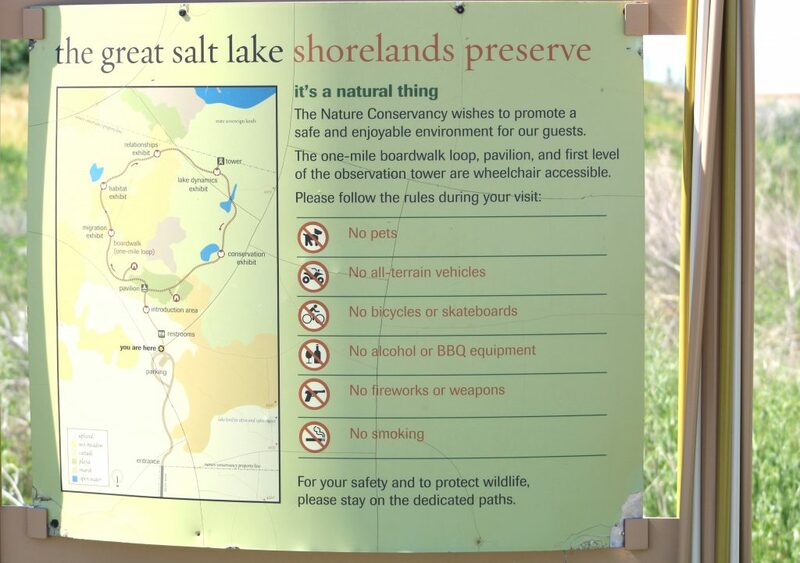 Check your state to see if there are any local refuges or preserves that you can visit. 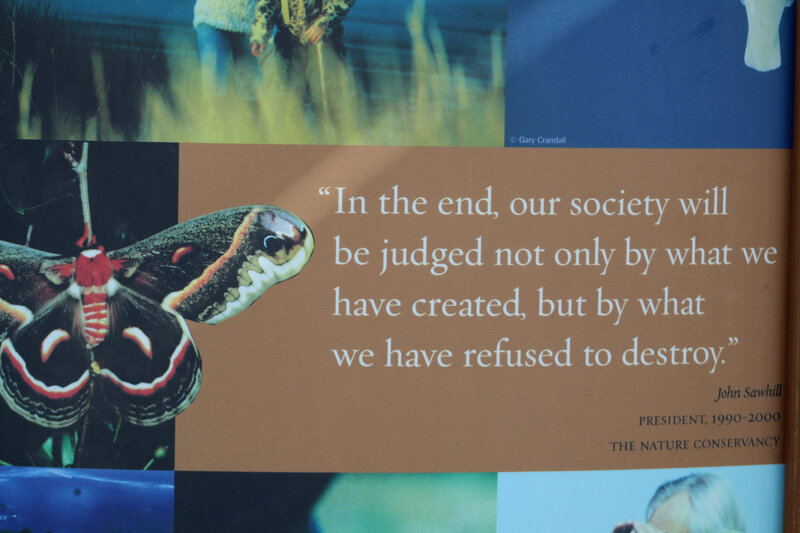 Check out all the information that is posted throughout the park and make notes, or take photos of them with your phone for later reference. Don’t forget to be still and listen. Look in one spot to see if you peripheral picks up any additional movement of birds, small mammals or reptiles. Visit it online beforehand so you will be familiar with it before visiting. 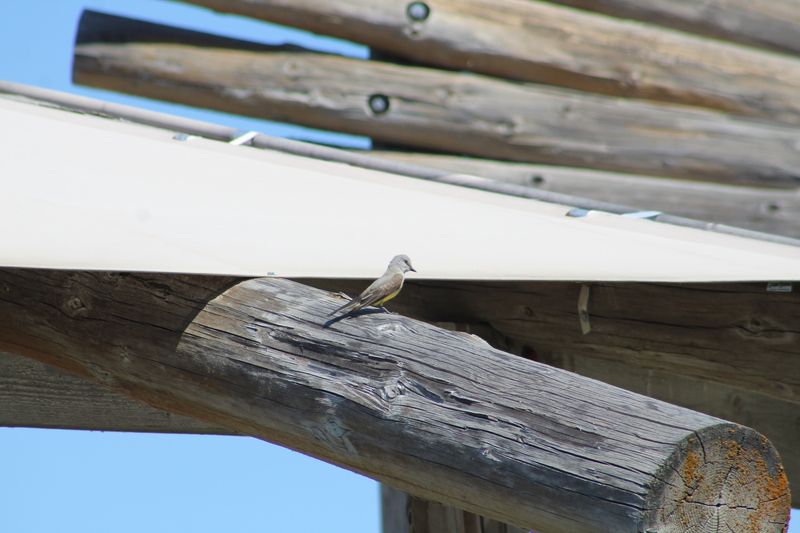 Also, visit it in different seasons for a variety of birds! I surely am glad to have visited this Refuge. Can’t wait to go back! This article contains affiliate links for your convenience (meaning if you make a purchase after clicking on the link, I may earn a small commission which helps to keep my blog up and going). This doesn’t cost you anything at all! Click here to read my full disclosure policy. My using affiliate links does not impact the content in this article. All thoughts and opinions are based on my own experiences.